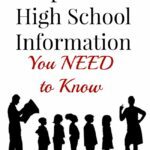 As you work on your parent-made transcript for your high schooler, here’s what you need to know about the SC Uniform Grade Scale. We’ve got this unique and complicated grade scale system set forth by the Department of Education. All public schools and most private schools utilize this policy. You may be wondering why it matters to us as homeschoolers, since we are not required to follow state standards anyway. Credits and grades are the language that is commonly understood by education professionals. I call it edu-speak. The doors of opportunity open for our students when we learn to speak in these terms. It’s true that we don’t *have to* conform to this grade scale. However, college admissions understand the SC Uniform Grade Scale. The SC State Scholarships distributed by the Commission on Higher Education also utilize the SC Uniform Grade Scale to determine eligibility. For these doors of opportunity to open for our homeschool grads, we need to utilize the SC Uniform Grade Scale policies. Click here for the entire 19-page Uniform Grade Scale guidebook. 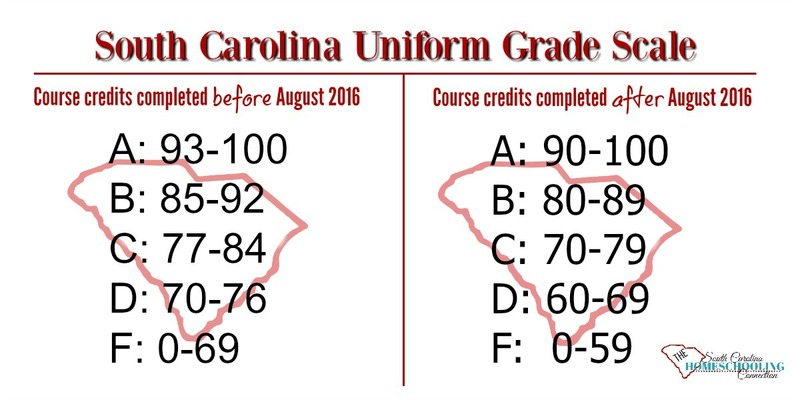 From here on, I’m going to shorten the South Carolina Uniform Grade Scale to SC UGS. The first thing you need to know for calculating your student’s GPA on the SC UGS is the number value for each course. It is not enough to say that your student made an A or a B. We have to know the exact number value for that. In another post, we’ll figure out how to calculate the number. For now just pick a number–85, 92, 98. Whatever it is. If your student happens to take any dual enrollment courses at a local technical college, you need to ask that instructor for the numeric grade before the semester ends. The colleges don’t automatically issue the number to you and they ditch their records as soon as their grades are posted. So, you have to be proactive in getting the actual number value for the course. Also if you have taken a course online or out-of-state, try to get that number so you can calculate your student’s GPA. Note the transition to the new scale: The number values are locked in at August 2016. Any credits that were earned before that date, the number value stays the same. If your student made a 90 for a course, that is a B. If the student made a 90 on a course after August 2016, that is an A. Usually, GPA is calculated on a 4 point scale. So, if your student earned an A, you count that as 4 points. If it was a B, you count that as 3 points and C is 2 points. You add up all those points and divide by the number of credits earned. All A’s is a 4.0 GPA. That’s the best you can get on that. But, South Carolina has a weighted GPA that could be as high as a 6.0. I can’t see how anyone really could get a perfect 6.0 GPA. But, GPA’s are often over 4.0 on SC’s Uniform Grade Scale. Average students doing College Prep work are frequently able to get higher than a 4.0 GPA. All A’s are not all equal value. Or B’s or C’s. 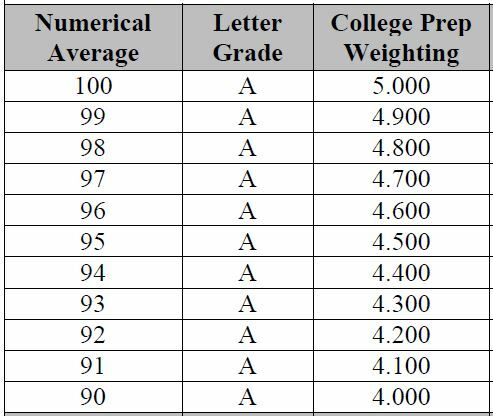 Each numeric grade converts to a specific GPA value. That’s why we need to know the exact number grade. See in the chart below for A’s. This is from the 10-point scale conversion chart. 90 to 100 is an A. All A’s are not the same GPA value. 90 is an A worth 4.0; 95 is an A worth 4.5, and 100 is an A worth 5.0. Each numerical average converts to a specific GPA weight value. Designate each course as College Prep (CP), Honors (H), or AP/IB/Dual Enrollment (D) weight. In another post, I explain what counts as an honors credit. If your student is doing Honors, AP or Dual Credits, that can bump up their GPA even higher. All 95’s are not equal value. The College Prep course for 95/A converts to 4.5. If the course was weighted as Honors, the 95/A converts to 5.0. And if the course was Dual Credit from a college, the 95/A converts to 5.5. Advanced Placement (AP) certified thru College Board and International Baccalaureate (IB) credits also convert to Dual Credit weight value. Now we have designated each credit with a specific number average and a weight value. It’s time to convert the values from the conversion charts. If the credit was earned before 2016, we use the 7-point conversion chart (click link for printable pdf). If the credit was earned after 2016, we use the 10-point conversion chart (click link for printable pdf). There you have it. Clear as mud, am I right? It’s complicated for sure. This student did 2 courses on the “old” scale: CP Biology course and earned a 93. Honors Chemistry earned a 91. And two courses on the “new” scales: College Chemistry with a 99 and College Biology with an 89. I’ve included the corresponding weight values from the charts. If you were calculating the GPA for these 4 courses, you add 4.0 + 4.25 + 5.9 + 4.9. See how the Dual Credit courses are worth well over 4.0. Even the course that is 89/B is worth 4.9 GPA because the dual credit counts much higher values. We add the weight values together to get 19.05 total. Then, divide by the 4 credits earned. The GPA for these 4 courses on SC Uniform Grade Scale is 4.7625. Just for fun, let’s also calculate GPA on the traditional 4.0 scale. The 9th-10th grade credits are on the 7 point scale: 93 is an A, 91 is a B. The 11th-12th grade credits are on the 10 point scale: 99 is and A, 89 is a B. The A’s are 4 points and the B’s are 3 points. Doesn’t matter if it’s honors or dual enrollment. Add 4 + 3 + 4 + 3. Equals 14 total. Divided by the 4 credits earned. So, the traditional GPA is 3.5. You can calculate both the weighted and unweighted GPA to include both on your transcripts. Note for student who have taken a gap year (or two or three gap years): Current graduates have some credits on both scales. So, we may need to recalculate their GPA to match this year’s graduating cohort. We can’t add anything new to the transcript after their graduation date. We don’t change the number values or weight values. In order to be fairly evaluated for scholarship eligibility and college admissions, we are supposed recalculate their GPA as if they were part of this year’s graduating class. The 2019 cohort has 3 years of the new scale and 1 on the old scale. The 2020 cohort has 4 years of high school on the new scale. It’s a huge pain for you to figure this system out for just your one student that is graduating this year. Especially since we’re phasing in the new grade scale one year at a time. Some of you are determined to DIY your own transcript and calculate this GPA. Hopefully, my tutorial here will help you do that. Many of you don’t want to do this calculation and don’t want to create your own transcript. So here’s what you can do instead. 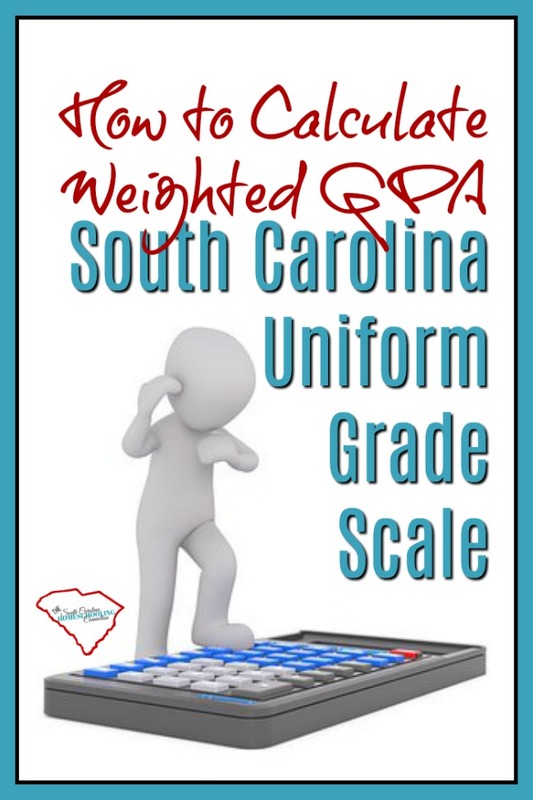 There is an easier way to get your student’s weighted SC GPA calculated. Let someone else help you do it. Save yourself the headache of it all–and just find someone to help you calculate it. If you try to calculate it on your own, have someone double check it. We have several experts in South Carolina who can do it for you and advise/assist you. They’ve already gone to the trouble of learning all this for you. You can find an accountability association that offers transcript assistance. Included in their membership fees or optional additional fees. Look thru this Accountability Associations Directory to find an association that offers transcript assistance. It’s totally worth it! If it’s too late to switch accountability associations and you need assistance now. 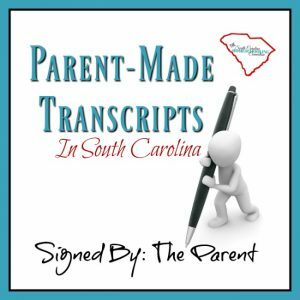 I can help advise and assist you in generating your own parent made transcript. 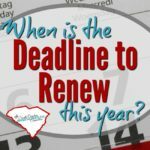 Contact homeschoolingsc@gmail.com for prices and process for submitting documents. Welcome to this unique and complicated grade scale system set forth by the Department of Education. It’s the SC Uniform Grade Scale! What other questions do you have about the SC UGS Policy?